It’s our 45th year in the Corvette business. When we went online we started with 26 listings, but now offer every part required to do a chassis overhaul on your 63-82 Corvette. When you call our shop, you will not be routed to a salesman. The guy who answers the phone is a mechanic specializing in 1963-1982 Corvette driveline, steering, suspension and brakes. You will get straight answers. Our shopping cart works with your major credit card or with PayPal. Either way, your credit card information will be protected by the latest 128-bit encryption technology on a secure site. If you would rather place your order by phone, call us toll free at (888) 581-3838. 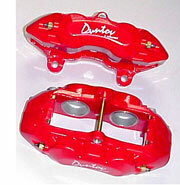 Duntov parts are competitively priced, but are definitely not the cheapest on the Internet. We do our own work and if we don’t make the part ourselves, we buy US made parts whenever possible. We race with the parts we sell, which means we have tested our products more than any other vendor on the Internet. There are no hidden costs with us; no handling charges, no freight (within the Continental US) and no cores are required. If you want to send us your cores, you can use the packaging we shipped your new parts in and we will by happy to buy them as a separate transaction. We have specialized in Corvette brakes for over three decades. We make our own pistons, and through Wilwood, we make our own aluminum calipers. Our stainless steel sleeved rebuilt Delco calipers are unique as well. We use the best US made seals and do our own machining. There are no better calipers available for your Corvette. In road racing, you get a lot of practice building rear ends. In thirty years of racing with these differentials, we had only one failure. We sheared the ring gear bolts at the Detroit Grand Prix. We feed almost 700 HP through our stock spec differentials, using stock stub axles and spindles, and have had zero failures. Our racing spec differential is absolutely the best that money can buy. Your 80-82 Corvette came with an aluminum Dana 44 differential. Nothing is interchangeable with the earlier Eaton diffs. We have been rebuilding 80-96 Corvette Dana 44’s for over 10 years. There are a lot of expensive re-engineered parts on the market today that promise to make your car handle like new. The fact is, when your Corvette rolled off the showroom floor, it handled great. We offer everything you need to get that feeling back again, and we won't waste your money getting there. Our cars hold lap records in our class at most of the major road racing tracks in the country. Everything you need to duplicate that handling is available right here. There can be a tendency to change everything when the steering feels like an old worn out car. When restored to new, your steering will feel great! Your Corvette front suspension was designed to brake in a straight and stable line. The most widely promoted rack and pinion system doesn't help these cars, as the bump steer is off the charts and it has to be mounted so low to the ground as to make it vulnerable in day to day driving conditions. Note that steering 'feel' can be highly influenced by the condition of the rear trailing arm bushings. When those bushings are worn out, you would swear the problem was in your steering! When Zora Duntov unveiled the independent rear suspension of the 1963 Corvette, he elevated the American sports car to a world class level. That design remained virtually unchanged for the next 20 years. In the last 25 years, we have learned how to keep this design competitive with the world’s best sports cars. You can’t find a better rear spindle than what we offer. These are drop forged and produced to the exact appearance and dimensional specifications, but with superior metallurgy to the original part. As you know, the rear spindle / bearing assembly has been the Achilles heel of these C-2 and C-3 Corvettes. The design was ahead of the materials. Now the materials have caught up. If you wish to ship your old parts to us, here is what we are currently buying. Remember, freight to us is your responsibility. After receiving, inspecting and (in the case of brake calipers) testing and accepting your parts, we will either credit your credit card or issue you a check. You don't have to buy from us to send in cores - we are always looking for good cores. Please email us for shipping instructions. Prices can fluctuate, so check here first. We are in the process of adding dozens of additional high performance parts to our interactive website. These parts are all engineered, manufactured and tested over years of racing, and are built and marketed exclusively by Duntov Motor Company. They include everything from bump steer blocks, to rear mounted front caliper mounts, brake ducts, rear mounted alternator mounts, L88 and Grand Sport flares, etc. For now, call or email us for additional information. Our shopping cart is programmed to include discounts for all orders over $4,000 NET. It is automatic, and the discounted price is computed and displayed before you enter your order. Our prices include UPS Ground prepaid freight to anywhere in the Continental United States. Free freight applies to any total order of at least $100. For orders less than $100, add $5 for freight. For USPS or Bax Global shipments to Alaska, Hawaii, Canada, Mexico, Europe, Australia or New Zealand, please email us for a quote. We ship UPS Next Day or Second Day Air for the net cost of the freight without markup. We warrant everything we manufacture for three years of normal service. Racing is not considered 'normal service'. For parts we do not manufacture, we back our vendor's warranties. We make it right with you and we take the issue up with the manufacturer. Email us for warranty terms and conditions for specific parts. We pack our products very well, but even UPS occasionally damages one of our shipments. It is the customer's responsibility to contact UPS and initiate the damage claim. Do not discard the packaging! If you are home when an obviously damaged package is delivered, refuse the shipment. That gets the ball rolling with UPS. If you come home to find a damaged shipment on your doorstep, contact UPS and send us an email. We will attempt to collect from UPS, but in the mean time we will get a replacement part headed your way as soon as possible. There are no 'Handling Fees' when you order from us. We figure the price of the product should cover writing up the order and boxing the product for shipment. We seem to be unique in that respect. We do charge a restocking fee for parts that are returned. For vended items, the fee is 15% plus the freight we were charged to ship the part to you. 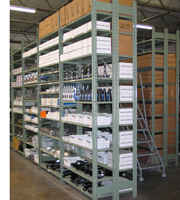 For items we manufactured for you, the restocking charge is 20% plus the freight.